Barix will evolve its innovation in SIP (Session Initiation Protocol)-based paging and intercom solutions at ISE 2018 (February 6-9, Amsterdam RAI, Stand 8-K255) with its new SIP Zone Paging firmware – the latest cost-effective paging and public announcement solution. To be debuted at ISE, Barix’s latest solution for SIP architectures more fully integrates audio and paging capabilities with IP-based telephone systems in a seamless, firmware-based approach. The new Barix SIP Zone Paging firmware runs on existing Barix hardware, including Exstreamer decoders and Annuncicom two-way audio devices, and enables systems integrators to implement a zone-supportable paging solution without the need to designate a SIP client for each individual paging point. 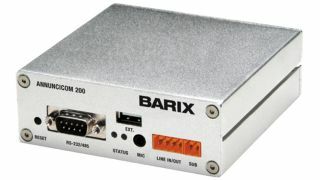 Page routing and communication is instead accomplished natively in the Barix SIP paging gateway.Configuration for this capability is required only once within the client port gateway firmware. As an example, a person will use the SIP phone and dial the gateway number, selecting the zones which are designated to carry the message to multiple loudspeakers at once. The SIP phones can dial into the paging system without a dedicated paging microphone station. The new SIP Zone Paging firmware represents Barix’s latest approach to SIP and Paging integration. It is an alternative to Barix’s SIP Client Firmware, also to be demonstrated at ISE, which allows systems integrators to equip loudspeakers and amplifiers with a SIP address to receive calls.